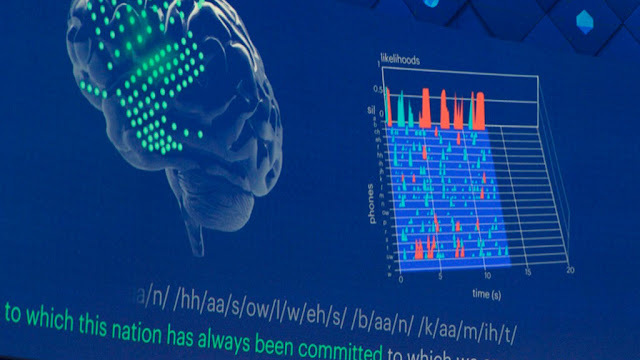 Es sounds like science fiction, but Facebook is actually working on a method of thought-reading: the world's largest online network would like to transform human thoughts directly into text. Need an example? At the in-house developer conference F8 in San José (18 and 19 April 2017), Facebook manager Regina Dugan gives the opportunity to send a text message to a friend without extracting the smartphone. At the moment, 100 words per minute are needed, which is realistic in just a few years, Dugan continued. In her speech, Dugan referred to recent studies at Stanford University. There, researchers succeeded in making a paralyzed woman write eight words per minute into the computer, thanks to electrodes in the brain, "as big as a bean" letter for letter. However, implants are not suitable for a massive use of the technology. Instead, one needs very sensitive sensors on the surface of the head, which monitor brain activity "one hundred thousand times per second to the millimeter". "Such technology does not exist today. We will have to invent them, "said Dugan. A team of 60 researchers is working on this vision at Facebook. In time, it would no longer be necessary to form words from individual letters in the head. A secondary effect is that people are then able, To express themselves in other languages ​​without having learned them. For example, the idea of ​​a cup could be translated directly into the corresponding foreign word in Spanish or Chinese. Not just Facebook is thinking about such a technology: tech billionaire Elon Musk is also probably researching in a new company how to connect the human brain directly with computers. The 45 year old is involved in the company Neuralink,which wants to develop corresponding electrodes according to the " Wall Street Journal " at the end of March. In addition to technologies for thought reading, Facebook wants to build a new developer forum around the so called extended reality ("Augmented Reality" or "AR"). Via the " Camera Effects Platform " one would like to integrate virtual objects into the real environment. The decisive device for this is the smartphone, with its camera and the screen, founder and chief Mark Zuckerberg on 18 April to the opening of the F8 conference. It is about games, but also about works of art that appear for viewers on a smartphone screen in the city, when they align their mobile phone camera to specific walls. Or messages that are only visible to certain people on the display. "We are starting today to build this new platform."